Just as happened under the previous administration, the current Trump administration faced the fact that federal agencies had run out of budget funds and were about to furlough their employees until more money could be accessed. Two popular attractions in New York State had to close last weekend. New York state government was to begin paying salaries for federal workers today. A major OOPS! Does no one double check before sending the text out to the printer, especially at this level? 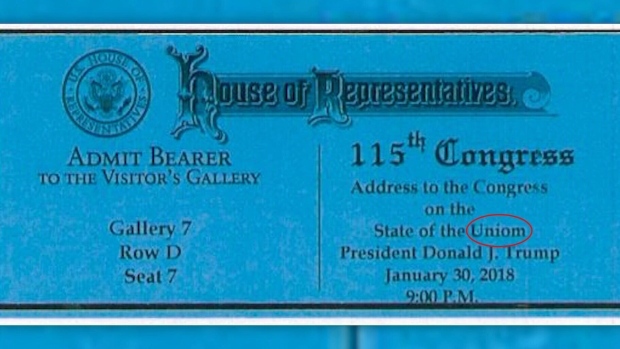 Tickets inviting guests to U.S. President Donald Trump's first official State of the Union address Tuesday had to be reissued after a misprint. The tickets read, "Address to the Congress on the State of the Uniom." Lawmakers had fun with the glitch: "Looking forward to tomorrow's State of the Uniom," Sen. Marco Rubio of Florida tweeted with a picture of the invite. Oi, didn't the republicans do the same to Obama during his term? Democrats to Both Bush Presidents, Clinton, etc? U.S. President Donald Trump accused congressional Democrats on Monday of being "un-American" and perhaps even treasonous for refusing to cheer positive news during his State of the Union address, as he turned an appearance that was arranged to promote new tax cuts into a session on bashing the political opposition. During what turned into a wide-ranging speech, Trump most notably criticized House Democratic leader Nancy Pelosi for describing as "crumbs" the bonuses of $1,000 or more that some companies, including the one he spoke at, are giving their workers as a result of the tax cuts. He also accused Democrats of being "un-American" for not clapping even for positive news during his address to the nation last week, in contrast to fellow Republicans, who Trump said were "going totally crazy wild" over everything in the speech. "They were like death. And un-American," Trump said about the Democrats. "Somebody said treasonous. Can we call that treason? Why not?" The former chief of the US Centers for Disease Control and Prevention says the decision to cut 80% of its epidemic prevention activities overseas could pose a grave danger to the United States because it "would significantly increase the chance an epidemic will spread without our knowledge and endanger lives in our country and around the world." The CDC informed personnel in the past two weeks that it was discontinuing its work in 39 out of 49 countries where its Center for Global Health helps prevent, detect and respond to dangerous infectious disease threats, such as Ebola and the Zika virus. The agency said it was forced to make the decision because it doesn't expect any new funding for the programs. How is this good for the US or the world? We have seen both make it over here, so why would you cut the programs? He hates science, but this is a danger to all including him. Former first lady Barbara Bush died Tuesday at her home in Houston, Texas. She was 92. Bush passed away shortly after deciding to forgo further medical treatments for her failing health. Gracious, kind, hard working, and a wonderful first lady. thinks Hitlers playbook should be brought back to life. Overt anti-Semites have been slowly creeping into Republican politics in the aftermath of President Trump’s successful, populist candidacy, and now one of them has a fighting chance of representing the Republican Party in a Senate race. The man in question is Patrick Little, an extremist with hardline anti-Semitic views who is backed by David Duke and other far-right extremists. Little will be squaring off in a top-two primary with 10 other Republicans as well as Democrats and independents on June 5 for the chance to oppose veteran Democratic Senator Dianne Feinstein. According to a recent poll, released last week, he very much has a chance of winning the right to face off with the incumbent. A poll conducted by local ABC News affiliates along with the polling company Survey USA, suggested that Little is polling at 18 percent of the vote on the Republican ticket, a full 10 points ahead of his next strongest opponent. The 84-year-old Feinstein, who first entered office way back in 1992, at the start of Bill Clinton’s first term, remains a solid favorite to win the state—polling at 39 percent. There was a recent article explaining how FEMA was not able to help Puerto Rico after its hurricane because most supplies had been sent to assist the US Virgin Islands with their needs. And when the killer storm did come, FEMA’s warehouse in Puerto Rico was nearly empty, its contents rushed to aid the U.S. Virgin Islands, which were hammered by another storm two weeks before. There was not a single tarpaulin or cot left in stock. Restoration of electricity to the remaining areas of Puerto Rico still without power has almost been completed. However, full power is not realistic as the power can still fail. Geography factored into the delays for returning power in rural areas. Lights are slowly coming on for the more than 950 homes and businesses across Puerto Rico that remain without power in hard-to-reach areas. Repair crews are sometimes forced to dig holes by hand and scale down steep mountainsides to reach damaged light posts. Electrical poles have to be ferried in one-by-one via helicopter. It is slow work, and it has stretched nearly two months past the date when officials had promised that everyone in Puerto Rico would be energized. And even as TVs glow into the night and people like 20-year-old delivery man Steven Vilella once again savour favourite foods like shrimp and Rocky Road ice cream, many fear their newly returned normality could be short-lived. Turmoil at the island’s power company and recent winds and rains that knocked out electricity to tens of thousands of people at the start of the new hurricane season have them worried. A long-awaited analysis of Hurricane Maria’s deadly sweep through Puerto Rico prompted the government on Tuesday to sharply increase the official death toll. The government now estimates that 2,975 people died as a result of the disaster and its effects, which unfolded over months. The new assessment is many times greater than the previous official tally of 64, which was not revised for nearly a year despite convincing evidence that the official death certificates failed to take full account of the fatal and often long-range impacts from the storm across the island. The revision came just hours after the release of a new assessment of excess deaths in the roughly six months after the storm, conducted at the government’s request by researchers at George Washington University’s Milken Institute School of Public Health. Their report found that nearly 3,000 more deaths than expected occurred in the wake of the storm — 22 percent more than the number of deaths that normally might have occurred in that period. In other related news, those Puerto Ricans still displaced from their homes have been told to leave the hotels they have been staying in as a judge sided with FEMA for not having to continue to provide shelter. The Federal Emergency Management Agency has spent $92 million on vouchers for families affected by the September 2017 catastrophe to stay in hotels in New York, Florida and other states. The agency has offered three extensions, but families took the federal government to court demanding continued housing aid until everyone had found a place to live. I can't believe what has been on the news all day and this is only 1 of two involving Trump. How on Gods green earth can he justify even saying this when people are dying, losing their homes and one community was wiped off the map. This is not how any leader should be behaving. Threatening to deny funding to people that desperately need it and his threats are disturbing to say the least. Threatening to deny funding to those risking their lives to fight it.